Sometimes revolutionaries don't look the part. 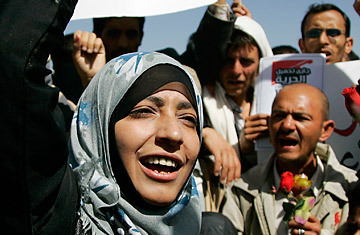 Tawakul Karman, Yemen's most active activist, favors long, loose-fitting gowns and coordinating headscarves. The 32-year-old mother of three looks, well, like a mom. And she acts like one too. Between weekly protests in front of Sana'a University, the chairwoman of Women Journalists Without Chains, an organization that defends human rights and freedom of expression, including the freedom to protest, can often be found trying to get other protesters out of jail. It's a place she is familiar with as well, having been there several times herself. And she is fiercely protective of Yemen's youth, decrying (often at the top of her lungs) a leadership that she says has robbed her generation of not only their future, but also their honor and their dignity. "We are suffering from a ruler who tries to control the country with constitutional amendments that will change Yemen into a monarchy," she tells TIME. Yemen, like Tunisia and Egypt, she adds, needs an end to a dictatorship in the guise of a presidency. Indeed, Ali Abdullah Saleh has been in power since 1978  one year longer than Mubarak. "The combination of a dictatorship, corruption, poverty and unemployment has created this revolution," she says. "It's like a volcano. Injustice and corruption are exploding while opportunities for a good life are coming to an end." More than 5 million Yemenis live in poverty, and nearly half are illiterate. Oil is scarce, and water reserves are declining (it's an often repeated statistic that Yemen will be the first country in the world to run out of water, sometime around 2025 at current rates of consumption). Yet the government seems unable, or unwilling, to address the fundamental problems of the people, says Karman. She says she has protested hundreds of times, both in the country's north and the south. But it was the refusal of the government to intervene in the case of the Ja'ashin, a group of 30 families that were expelled from their village when the land was given to a tribal leader close to the President, that launched her on the revolutionary path. "I couldn't see any sort of human rights or corruption report that could shake this regime. They never responded to one of our demands. It made it clear to me that this regime must fall." Tunisia has Mohammed Bouazizi, the man who set himself on fire, and Egypt has Khaled Said, the victim of police brutality. For Yemen, says Karman, it is the Ja'ashin. "Their slogan was 'Ali Abdullah Saleh made me hungry.' They've become icons." On Tuesday, the fifth straight day of protests, government supporters armed with sticks and knives attacked pro-democracy demonstrators calling for Saleh's ouster. Karman, however, does not believe in matching force with force. On her office wall hang portraits of Martin Luther King Jr., Gandhi and Nelson Mandela. "We refuse violence and know that violence has already caused our country countless problems," she says. Al-Qaeda in the Arabian Peninsula has its base in Yemen, as does Anwar al-Awlaki, the American-born extremist preacher who is suspected of inspiring a whole host of would-be jihadis, including underwear bomber Umar Farouk Abdulmutallab. The U.S. considers Yemen to be a key counterterrorism ally, and has pledged some $300 million to the government for pursuing al-Qaeda-affiliated extremists. The international community is supporting the wrong people if it wants to reduce the threat of extremism, Karman argues. "The peaceful policy of the youth is the only way out against terrorism. There is no other solution." If she succeeds with her revolution, she says, the world will be safer: "We refuse the movements of the extremist elements  even if they have good and just demands. We refuse groups like al-Qaeda because they have no real goals except for blood." They also taught the Yemenis the power of social media. Facebook and Twitter posts have called thousands more to the streets, as has a more old-fashioned medium: xeroxed flyers rolled out at Sana'a University. Positive coverage from satellite channels like al-Jazeera and al-Hurra have helped, both by encouraging Yemenis to protest and exposing them to the support of the outside world. Yemen is no different from any other country, says Karman. "The future is unknown." But what is known is that Yemen is part of a community of nations that is finally starting to shake off a plague of dictators. "The spark started in Tunisia," says Karman. "What stabilized this revolution was Egypt. It gave light and hope and strength to people everywhere. Now there's a race between Yemen and Algeria to see who will be next. And if we succeed here, and I believe we will, revolutionary movements in every Arab country will grow stronger." And more revolutionaries will start looking like Karman. See TIME's complete coverage: "The Middle East in Revolt." See photos from protests across the Middle East.